A big thank you to Emily Gardiner for helping me get through my test. She has been a brilliant instructor throughout my whole lessons and tests. 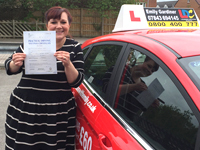 I highly recommend her to anyone wanting to learn to drive as she is calm, relaxed and professional at all times. 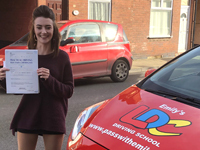 Emily is a brilliant instructor so thank you so much for all your teaching skills. My instructor has been amazing she is very patient and reassuring. I don’t doubt if I didn’t have her I wouldn’t have passed. Always made sure to ask me questions on the move and constantly going through my LDC book. 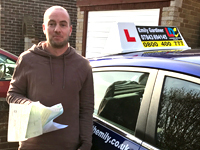 passed 1st time with only 7 driving faults. I think Emily was an amazing instructor, since the beginning I was very glad I picked her. If I had to do it all again it would be with Emily. Highly recommended. Learning to drive has been a great experience for me. I made full use of the workbook and videos ensuring I was well prepared for every lesson. Emily has been amazing! She has the ability to always say the right thing at the right time. Always making me feel safe and supported. But most importantly she has made it fun which has left me feeling really positive and excited to get out driving on my own. Emily was the best teacher, she was really understanding and patient with me. She really knows her stuff and helped me so much. She never let me give up even when I thought it wasn’t possible. Highly recommended I am going to miss Emily So much. We had only worked together for a short time but I enjoyed it from start to finish. 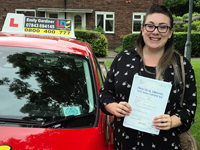 I felt really relaxed with Emily I booked my test quite early on but my confidence just grew and grew with Emily. It was a great way to learn Emily made it so easy, she was easy to talk to and comfortable to be with. I would highly recommend Emily she was a great instructor. Emily is a great instructor very patient with me all the times. 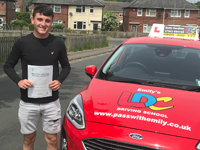 The areas and the big car park at the beginning really helped with my early stages of driving they were very well picked and it gave me a lot of time to practice. 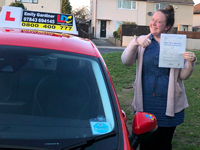 Emily was very supportive through out and what I liked is that if I wasn’t getting something right it was always broken down very well and stripped back if needed. Emily always put me at ease and we had a very good easy relationship highly recommend. Emily is a great instructor made me feel so comfortable every lesson. 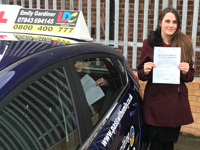 I really enjoyed learning with Emily, she was very clear on instructions and very understanding. We always worked at my pace and I just stuck with it. Best thing to do to pass your test is listen to your instructor and ask a lot of questions. Can’t thank Emily enough for all her help. Great Instructor will highly recommend. Emily is a great instructor she made it so easy to learn. She taught very well always patient with me. Great instructor. 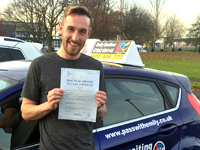 I was absolutely over the moon to have passed my driving test. Emily is a great instructor she helped me keep my nerves at bay, she is very warm and friendly. Nothing was too much trouble she is very patient and compassionate. 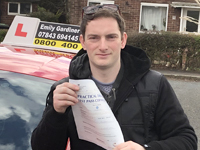 Emily helped me to gain the confidence that I needed to pass my driving test. 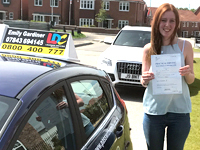 I was delighted to have passed my test, when I started driving with Emily I had no confidence and never thought that I could do this. Emily was exactly what I needed she had the patience, she never got cross with me and was so calm throughout. I am so grateful and thankful to have passed. 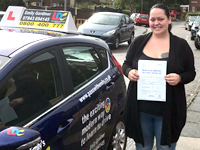 Kim passed her test at pontefract for the 1st time. Emily is a great instructor she took me out of my comfort zone when I didn’t really want to but Emily always knew I could do it so the little push really helped. I found learning to drive really easy with Emily and I can’t thank her enough fantastic instructor. 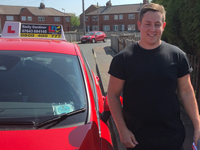 I am over the moon to have passed my driving test. I had my ups and downs but the support and help from Emily is incredible. The training was fantastic, Emily had so much time and patients for me. I would recommend her to anyone. Thank you so much. Passed her test with only 2 driving faults. Emily is extremely calm and relaxing, very understanding. Makes it easy to understand what I have to do. Lovely lady and if I had to do it again I would choose Emily 100%. Passed her test with only 1 driving fault. 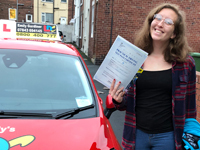 I enjoyed learning to drive with Emily, she kept me nice and calming especially at beginning as I was so scared when I first started but Emily kept me calm all the time right to the end. Emily reassured me on the lessons and the progress that I made. We stuck to the LDC learning system which is great and we would go back over anything that I did not fell happy about and that needed improving (eg Hills) and this really did boost my confidence. I would highly recommend Emily as a driving instructor she was great and I am sad to be leaving. 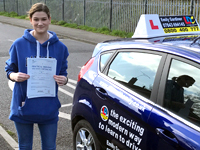 Passed her test with only 5 driving faults. 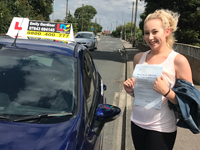 Emily kept me calm and collected the whole way through the learning process and the driving test. I passed my test. Emily made me feel so comfortable all the time and helped me so much. I am over the moon that I have passed thank you so so much. 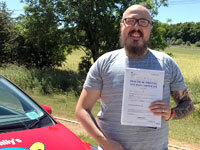 I passed my test with only 3 driving faults. Emily is a brilliant instructor, she make me feel so comfortable every lesson she made it so enjoyable. Thank you. 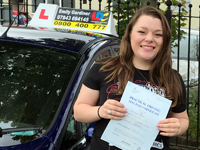 Emily is a great driving instructor helped me to pass my driving test with only 2 driving faults. Emily very calming and keeps you cool under pressure. I would recommend her to anyone. Thank you for your help. 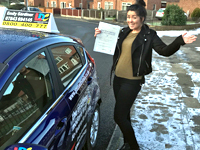 Toni took her test and passed with only 1 minor. It took a bit to get there but she passed. 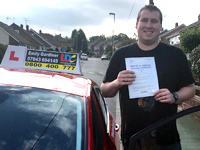 I passed my driving test 1st time with only 3 driving Faults. As I could already drive but just never taken a test I asked Emily to help me and she did. 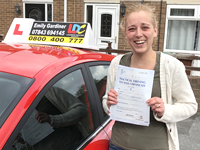 Emily is a brilliant driving instructor she has built my confidence to make me a better driver on the road. She has given me my life back and changed my life. 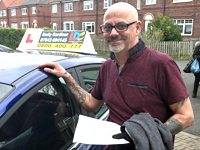 I am so thank full for meeting a wonderful women and a brilliant driving instructor. I am so pleased to have passed my test. Highly recommended. 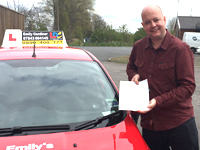 I passed my test 1st time with only 5 driving faults after only 30 hours in 11 weeks training with Emily. I rate Emily 5 stars out of 5 stars. The LDC workbook helped me a lot as we had a week on week plan and knew what we were doing every lesson. Emily was always positive and fair even when it was not my best driving. Communication with Emily was always good and everything was handled in a professional way. 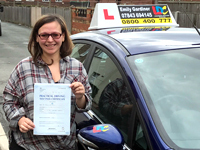 I would recommend Emily to anyone she was a great instructor. Another pass today. A massive congratulations to Charlotte you have done a fab job. I have loved meeting and working with you. Wish you all the best with your driving. Stay safe. My 1st pass today with Sean. Congratulations it's been a pleasure coaching you. Stay safe and don't have that music too loud.